Beyond the borders of the Bel Paese, there is an often hostile world; A world where it’s not always mozzarella that glows over pizza. Beyond the borders of the Bel Paese, there are, fortunately, thousands of warriors ready to defend that mozzarella and beyond. The kitchen is their battlefield, pots and pans their weapons, the traditions of Italian cuisine the precious treasures to keep. Who are we talking about? Italian chefs abroad and the passion that drives them every day to protect real Made in Italy. Abroad, everyone loves Italian cuisine, but not everyone really knows our products and authentic recipes. It often happens, therefore, that customers complain that there is no carbonara cream or want to add “pepperoni” on the pizza. And so it’s up to our chefs, miles and miles away from dear Italy, to have the daunting task of explaining the real carbonara, the real pizza, or the real Parmigiano cheese every day. Or to invent valid alternatives to make our products appreciated with local food habits, combining exotic tastes with homegrown delicacies. We at I Love Italian Food strongly believe in the power of our chefs, the first ambassadors of Italian cuisine in the world, to spread authentic food and wine culture abroad. This is why we have created a new project, that gives a word from one of the chefs weekly. We ask them to tell their story, and to tell us about their experience from every corner of the globe, in contact with different culinary cultures. The stage of these stories is Show Food, the new broadcast program on Radio Radio every Monday at 12.00, hosted by Francesco Vergovich and Enrico Camelio. United States, France, United Arab Emirates, United Kingdom, Thailand, China and Australia are just some of the countries from which we interviewed those whom, every day, conquer the title of Warriors of made in Italy—the same people that defend the treasures of our tables. With passion and commitment, they make a fundamental contribution to the spread of real Italian food in the world. 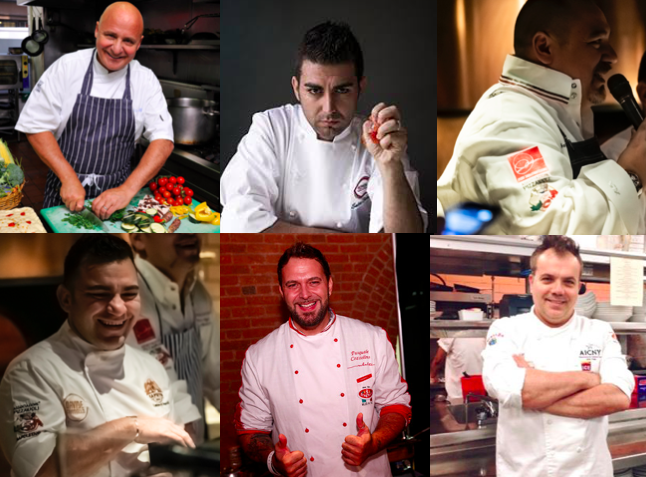 Special thanks to the chefs interviewed in this first edition of Show Food, and to the many others that will come: Ciro Cristiano, Luca Tresoldi, Pasquale Cozzolino, Salvatore Cuomo, Stefano Brombal, Carmine Amarante, Raffaele Solinas, Salvo Sardo, Aldo Zilli, Alessandro Miceli, Luca Appino, Michele Casadei Massari, Leonardo degl’Innocenti, Fabio Nompleggio, Peppe Errichiello, Giovanni Alajmo and Davide Civitiello.